As we continue to deep dive into our core industries’ history, today we’re tackling yet another industry we work closely with, the agricultural equipment industry. Again, by getting additional insight into your industry’s history, we hope to expand our knowledge in helping to serve you. The history of Agricultural equipment reaches much farther back than the last industry we looked at, Commercial Trucking, as the public needs in farming arose earlier than those of transporting goods. You could even argue that the development of agricultural products birthed the need for transportation! 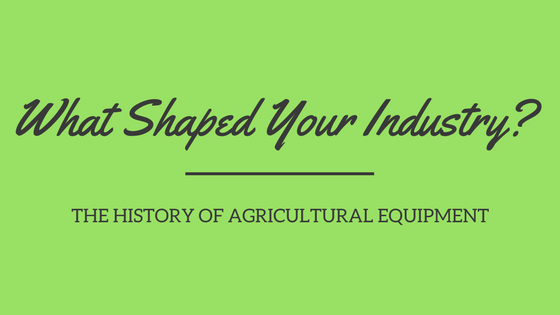 It is much debated when the formation of the agricultural equipment industry began. Some might consider the horse and wooden plow as being the first piece of “agricultural equipment”, however for the sake of time we’ll pick up the story with 1797, when Charles Newbold patents the first cast-iron plow. Forty years after this first factory-made plow, John Deere took this invention to the next level with the steel plow, paving the way for this well known manufacturer to take their place at the top of the ag industry. With the additions of the practical threshing machine, the McCormick reaper, and chemical fertilizer in the 1840s, these factory-made assets pushed the industry to commercialize itself officially, increasing farmers’ need for funding and expansion. As the farmers of this time adopted the new technology, from 1850-1870 the productivity of farmers really ramped up! In 1862, the method of labor changed from manpower to horses doing the heavy lifting, this is often identified as the first American agricultural revolution. This continued to evolve from 1945 through 1970, or what is known as the second American agricultural revolution, as the tractor was developed and retired the use of horses in favor of mechanized power. From the 1980’s to today, this industry has taken the initiative to care for the planet, as it gives them their source of purpose. No-till practices have become the standard for every farmer in efforts to stop erosion, and more farmers are getting on board with other low-input sustainable agriculture (LISA) techniques to decrease chemical harm. Farmers are famously skeptical of change, since the risk of messing up their entire harvest is increasingly high. If they can overcome these challenges and make the right scientific adjustments to their process, all the while conserving their resources, these improvements will boost farmers’ profits, by cutting costs and increasing yields, and should also benefit consumers in the form of lower prices. We look forward to seeing how this industry evolves especially considering these future factors of concern. We believe in you farmers, you’ve made strides toward a better world before and you’ll do it again!